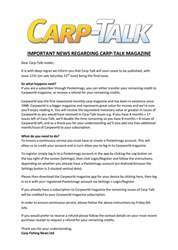 This week’s issue of Carp-Talk (issue 1007) is available to download now! James Pierce recorded the best catch of the week by a country a mile thanks to fish of 48lb 6oz and 51lb 2oz from Wellington Country Park. Backing up his catch, we have got a forty from Bedfordshire, a stunning 37lb linear and a mid-thirty from Somerley Lake. 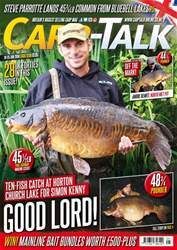 Garth Ethelston has got some ‘Winter Tips’, Scott Lloyd concludes his Christchurch three-parter, and Jon ‘Shoes’ Jones reveals a neat chod rig presentation ideal for venues where leaders are banned. 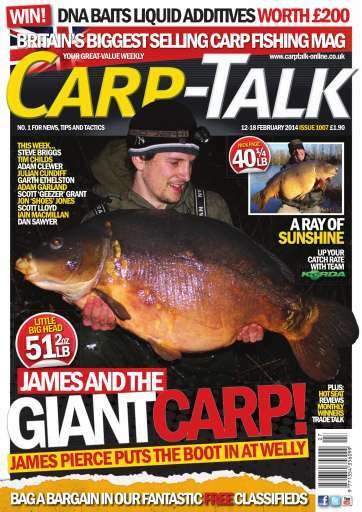 Dan Sawyer offers the first part of ‘A Season for Change’, 2013 World Carp Classic winners, Lizette Beunders and Bianca Venema, are in ‘Getting to Know’, and Steve Briggs talks of winter changes in ‘Continental Capers’. 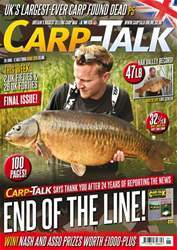 We have also got Adam Garland, Adam Clewer, ‘Hot Seat’, reviews of Fox and Nash products, and ‘Trade Talk’. There is also £200 worth of DNA Baits liquid additives to be won.